I feel a bit of a fruad with this blog at the moment since my trainers are in limbo until I get my insoles. However, my life is not without running as I am helping out at the Fling on Saturday. Dario is a tad concerned how I am going to cope with only being a marshall rather than next in line of command as I am for the WHWR. For some reason Dario and my better half DQ seem to be under the impression that I enjoy being in charge and being in control. Now in all fairness I did give DQ detailed instructions on how to answer a phone while I went to the toilet during last years WHWR but I am very protective of my runners, so I had to make sure things were in hand during my two minute absence. I am at Beinglas checkpoint with the Lovely Lee so I am excited as we can have a proper girlie catch up. 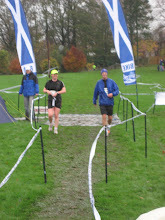 At the River Ayr Way race we debated about having a marking scheme for the male runners with categories such as general good looks, legs in shorts etc etc but there was not enough runners. The Fling however is a different kettle of fish!!! I think Runners world would love a Fling top totty list !!! !